weddings & corporate events across Surrey. Having been established since 1976, the recognition we have gained around Guildford, Woking and the South East for supplying first class reliable, yet competitively priced services, has been gained through over 40 years of experience and the ability to surpass client expectation. The spearhead of our organisation is of course our drivers, “You don’t get a second chance to make a first impression”, as the saying goes and we pride ourselves that our drivers, are not only our agents but ambassadors for the company, providing the levels and types of services, that ensures you will always be a satisfied returning customer. With a fleet of over 10 coaches with our own on site workshop and engineering facility our team of dedicated professionals will ensure that all the companies vehicles are kept to the very highest standards whilst on the road. Newtons Coaches are and have been long-term members of the CPT maintaining the guidelines laid down for the benefit of its customers and client base. Whether you require coach hire for a theatre outing, business conference, museum or school trip, sports fixtures or to get your Wedding party to & from the church or hotel, we can fulfil your every requirement. read more about our coach hire service. Let Newtons coach Wedding hire transport help to take the hassle out of your wedding planning. We offer a variety of services for weddings including providing travel to and from venues, hotels etc. Read more about our wedding coach hire service. 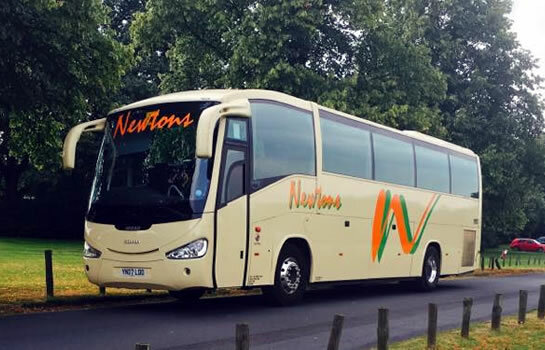 Newtons Coaches have been providing services to local schools and colleges for over 30 years. Our services for schools fall into two categories, firstly ongoing contract work providing transport for pupils to/from school and secondly coach and driver hire for school outings and excursions. Read more about our school coach hire service. Newtons Coaches are often called upon to help the train service in times of need. Whether is an engineering work on the lines or adverse weather conditions Newtons Coaches are ready to assist the train operators to ensure commuters and members of the public can complete their journey. Our large fleet consists of coaches for almost any occasions. Our largest coaches offer a passenger capacity range from 49 to 57 passengers. Our large fleet consists of coaches for almost any occasions. Our mini coaches offer comfortable travel for 35 passengers.